Executive Producer - Harley Goldsmith C.B.E. Had this DVD for a few years now. The solo in "I Shot The Sheriff" is nothing short of amazing. "Five Long Years" is one of the best live blues songs I've ever seen. "Old Love" is great. The "I'm Tore Down/ Have You Ever..." set is fab. White room's solo might even be better than the one on "24 Nights" "Holy Mother" a great way to end the show. I'm lucky enough to have this DVD signed by EC himself, which makes me like it even more! 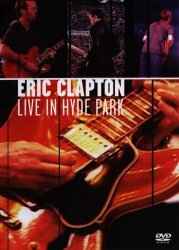 A must for ANY Clapton fan! This DVD would have to be one of the best live concerts of the great man I have ever seen. Its just brilliant, especially if you have some home theatre gear and DTS capabilities, if not! It doesn't matter, its still brilliant. Three tracks come to mind. 1/ Shot the sheriff, I had heard this song so many times because of its commercial promotion, I was sick of it and hated it but! in this concert he rearranges the song and its just brilliant! 2/ Old love, again he goes to another land, " Clapton Land " and at the end of it all he smiles back at Steve Gadd to signal his return to reality, I cry! 3/Every Day I Have The Blues, Brilliant Musos Jamming stuff just makes you wanna get up and dance. Oh Hell!! The whole damn thing is brilliant! Just buy it! A great DVD wonderful sound quality, sharp video. Eric is in top form as he truly burns up classics such as "I Shot The Sheriff", "Five Long Years", "White Room" and more!! The show has a great blues feel the band is tight. My personal fave is the Freddy King melody. Wow! Clapton at his best!!!! Great show, with an amazing amount of energy. The DVD also has songs not included on the VHS that are just priceless. I must have for any true Clapton fan.